The first thing we learn in these words is how duty is gradually revealed. Our blessed Lord, in His knowledge of our hearts, never overloads His revelations. It is characteristic of the great apostle that he should instantly react on his experience. Vitality is measured by reaction— when we fail to react, then we are growing old—and Paul, vital to his fingertips, instantly reacted to the Lord— “Lord, what wouldst Thou have me to do? Tell me now. Make my future plain. Show me the service I can render Thee, and I shall do it even to the death.” And it was then that Jesus answered him, “Arise and go into the city, and it shall be told thee there what thou must do.” Suddenly was Paul converted. Gradually he learned what that involved. Paul found that illumination of the soul is different from illumination of the future. Step by step, duty after duty, each faithfully taken and performed, was the road to his service and his victory. That lesson which the apostle learned is one secret of victorious living still. The next duty is the key to everything. When the future is dark to us as it was dark to him, when we cannot discern the larger will of God, when we want to be used and cannot find the road, when we are dubious of our capacities, always for us as for this great apostle there is a present and commanded duty on the doing of which everything shall hinge. Often it is a very lowly duty, and that is where so many people fail. Dreams may be spun upon the looms of God, but remember that dreams may be our traitors. We dream of voices, heavenly voices, crying to us, “Arise, do big things worthy of your powers”; and the voice on the Damascus road is crying, “Arise and go into the city.” Had Paul not gone, he would never have learned his mission. He learned it by obedience. He learned it by unquestioning acceptance of the first dull thing that was demanded. And whatever the particular service be that God has in store for anyone of us, we learn it just as the apostle did. Service is gradually given. Duty is gradually shown. Do the thing that is demanded now, and out of that the vision shall emerge. It was a poor, dull thing for that illumined soul to go tramping on another mile or two, but it led him to the service of his life. The other profound lesson of the words is that new vision is for old environment. Converted, changed in his whole being, Paul has to step out on the old road. 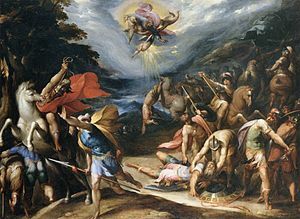 To Damascus the apostle had been journeying when he set out to persecute the Church. Then came the flood of new life within him and the overwhelming experience of conversion. And the beautiful and Christlike thing is this, that Paul was not swept into any new surroundings but bidden to hold on the old road. Wert thou making for Damascus, Paul? To Damascus thou art still to go. There is no new path for thee across the hills. There is nothing but the old familiar highway. Resume it. Set thy face to it again. Take up and prosecute thy interrupted journey. The new vision is for the old environment. Now that is a lesson we do well to learn if we want to handle life aright. For the old roads never seem so dusty as after some great stirring of the heart. There are long periods when we are content. We are happy in the daily round. We are satisfied with our nutshell, unlike Hamlet, because we have no dreams. But then some day to us there comes the vision— the light that never was on sea or land— and there is born the passion to escape. It may come when the glow of youth is burning, or when the beauty of the world has caught us, or when love has wakened with its divine unsettlement, or when the chair is empty and the grave is full. Who has not felt in seasons such as that the longing that arises in the heart to have done with the road that is leading to Damascus? It is not easy to go quietly on then. It is not easy to get back to duty. We hate the drudgery— it is intolerable— we crave a more congenial environment. And it is then that to our restless hearts Christ comes as He came that noonday to St. Paul, saying, “Arise and go into the city.” He does not offer us a new environment. Vision is not given for new environment. It is given that we may take the glory of it and shine it on the old and the familiar. It is given that the common round, the irksome and unceasing drudgery, may be illuminated and transfigured.